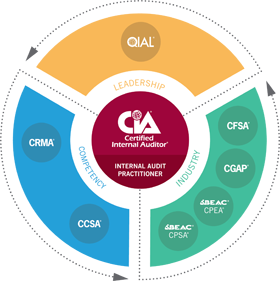 IIA Nigeria offers trainings that will enable you benefit from the comprehensive certification portfolio for internal auditors and related professionals. These certifications can serve as the key to unlocking your next opportunity within the profession, enhancing your credibility and adding clout to your resume. By earning your Certified Internal Auditor® (CIA®), Certified Government Auditing Professional® (CGAP®), Certified Financial Services Auditor® (CFSA®), Certification in Control Self-Assessment® (CCSA®), and Certification in Risk Management Assurance™ (CRMA®) certification, your clients and employer know that you are a valuable team asset who is highly motivated, knowledgeable, and committed to ensuring quality is part of everything you do. IIA certifications set you apart from other professionals, unlocking your full potential and opening up countless doors of opportunity for career growth and success. See what awaits you on the other side of the door. Access CCMS to begin the application and registration process or contactQIAL@theiia.org for more information. You will have access to a tutor who will assist you in your preferred areas of study. You can contact your tutor with questions. The learning resources are interactive. Podcasts, videos, and case studies will make learning stimulating, rather than a chore. You can contact other QIAL students via online forums to share and discuss ideas and issues. The learning system offers the flexibility to study on your own schedule. As the demand for top talent and acumen in the financial services industry rises, there is no better way to establish your credibility than with the Certified Financial Services Auditor (CFSA) designation. Earning your CFSA from The IIA can set you apart from peers. Earning a professional credential from The IIA is the best way to demonstrate your commitment to advancing in this competitive niche and communicating your breadth of knowledge. Be poised to drive organizational change with a Certification in Control Self-Assessment®. This designation makes a statement to executives and your colleagues about your knowledge of CSA fundamentals, processes, and related topics such as risk, controls, and business objectives. The CCSA exam is offered in the following languages: Chinese (Traditional), English, Italian, Japanese, Portuguese, Spanish, and Turkish. The standard CRMA Core Exam will be a 100-question, multiple-choice exam, with a seat time of two hours. These exams will be instantly scored like all of the other IIA exams, and will be administered at Pearson VUE testing centers around the world. All Certification in Risk Management Assurance® (CRMA®) eligibility requirements will apply. The CRMA exam is available through computer-based testing, allowing you to test year-round at more than 500 locations worldwide. Candidates are able to sit for exams at any IIA-authorized Pearson VUE testing center worldwide, regardless of whether the testing center is located in your hometown or country. To locate the testing centers nearest you, visit the Pearson VUE website. You must apply and register in The IIA’s Certification Candidate Management System (CCMS) prior to scheduling an exam. Access CCMS and visit the Complete a Form section to begin the CRMA application process. *This offer applies only to the CRMA application fee. This offer may not apply in countries where exams are administered through Institutes with certain agreements. Please contact your local Institute to verify if the offer is valid in your county. Excludes exam registrations. BEAC issues the Certified Process Safety AuditorTM (CPSATM) professional designation. The Certified Process Safety Auditor credential demonstrates one’s understanding of important Process Safety elements and regulations for all industries with processes that involve explosive materials. BEAC also issues the Certified Professional Environmental Auditor (CPEA®) designation. The CPEA credential demonstrates one’s understanding of today’s ever changing environmental, health & safety regulations. The CPEA designation is fully accredited by the Council on Engineering and Scientific Specialty Boards (CESB). BEAC CPEAs qualify for Professional Membership status with the American Society of Safety Engineers (ASSE). The Board of Environmental Health & Safety Auditor Certifications® (BEAC®) is an independent, nonprofit corporation established in 1997 to issue professional certifications relating to environmental, health, and safety auditing, and other scientific fields. BEAC is a member of the Council of Engineering and Scientific Specialty Boards (CESB). CESB has granted full accreditation to BEAC’s Certified Professional Environmental Auditor (CPEA®) certification. This recognition and accreditation is tangible evidence of BEAC’s commitment to excellence of its CPEA program and provides assurance to applicants, certificants, and employers of certificants that the BEAC CPEA certification program is operated consistent with recognized credentialing practices. BEAC has signed a Letter of Agreement with the American Society of Safety Engineers(ASSE), and CPEAs qualify for ASSE Professional Member Status. BEAC has also signed a letter of agreement with the American Industrial Hygiene Association (AIHA), whereby the AIHA recognizes and endorses BEAC’s CPEA certification. BEAC and the Auditing Association of Canada (AAC) have signed a Declaration of Cooperation to provide mutual recognition of certification and training programs. In April 2009, BEAC and the American Chemistry Council (ACC) renewed a memorandum of understanding giving BEAC an oversight role in implementing the ACC’s Responsible Care® (RC) third-party certification requirements. BEAC is the only organization currently offering the RC Auditor examination. BEAC certification qualifies for the U.S.